Are you F-E-A-R-L-E-S-S…without fear…ready to leap into new adventures...? Or are you F-E-A-R-F-U-L...full of fear…scared to try anything different…? God encourages us to be fearless, and that requires bravery, courage and faith. God doesn’t want us to be fearful. WHY? Because He is always with us, and because through Him we can do ANYTHING! 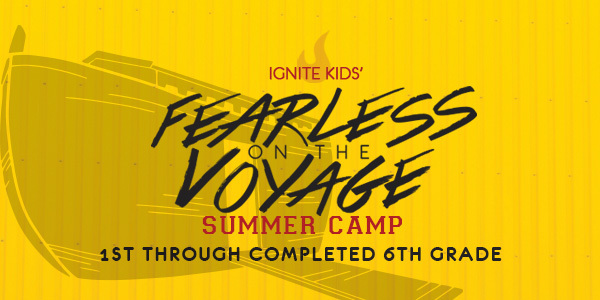 If you’re up for anything with God, and are a completed 1st grater to completed 6th grader, then FEARLESS SUMMER CAMP is just for you! Join us July 8-12 from 9am-Noon for a grand week of adventure. The cost is $18 for the whole week of activities, crafts & snacks, as well as the choice to learn a dance and perform it Friday night, pick creative arts and display your work, or select basketball and have a playoff game on Friday. Rush into exciting activities like dance, creative arts, or basketball. Replenish yourself with yummy snacks. Refresh in Bible lessons and small group time. Renew your creativity through special crafts and games. If you have questions, please email Brenda. © 2018 Calvary Chapel Melbourne. All Rights Reserved. We’re Hiring! To get the best possible experience using our site we recommend that you upgrade to a newer version of Internet Explorer or choose another web browser. A list of the most popular web browsers can be found by clicking the upgrade my browser button below.